Samsung Smartphones are soon going to get Android 6.0 Marshmallow update . If you own a Samsung Smartphone then you can discover whether and when your device will get Official Marshmallow update . There are two phases of the RoadMap . 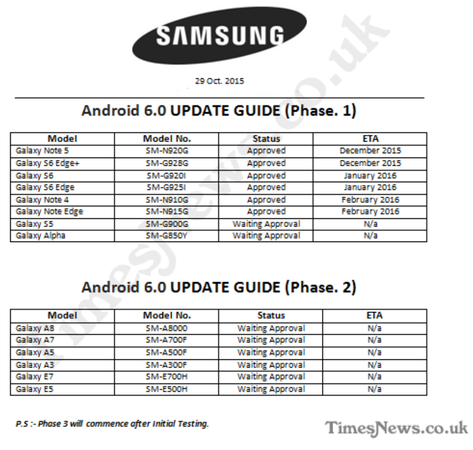 In First Phase Samsung Galaxy S6 edge+ and Note 5 will get update to Official Marshmallow next Month , while s6 , s6 edge , note 4 and note edge will get update next year ( Jan - Feb ) . While Samsung Galaxy S5 and Samsung Galaxy Alpha, are awaiting technical approval. The Second Phase includes Samsung Galaxy A8, Samsung Galaxy A7, Samsung Galaxy A5, Samsung Galaxy A3, Samsung Galaxy E7 and Samsung Galaxy E5 . The devices in second phases are awaiting approval . If your Smartphone is not in the list than you should wait for Phase 3 Roadmap .